To start things off, I was hoping to give an update on my dear plants! My bokchoy / native pechay is growing wonders. It’s truly amazing. They’ve grown to such a size that I thought you can harvest them, but when I saw my uncle’s pechay, my pechay is still small. So I’ll have to wait ’til then. What interests me though is my darling parsley, Seymour. Seymour was part of my parsley leftovers during Christmas. The trick is not to cut the parsley down to the root. Leave around 2 inches of allowance and then plant the root on healthy soil. The parsley should start growing after a few days. 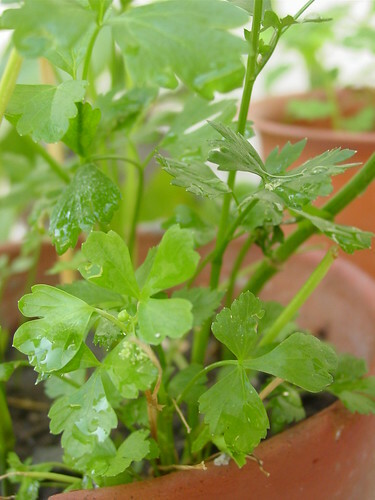 And just smack after a week, you’ll have buds growing, and a little longer, your parsley will flower. I suggest to keep on letting it grow until you have something of a parsley bush in your pot. Mine is still in its early stages so I’ll let it grow for a bit. Seymour would be stage 1 to my intended herb garden. I have parsley and oregano already on the works. I’ll just see if I can try basil again. On other news… my tomatoes have started to grow! YAY!! Kewl…..Your garden really rocks khursten!! Let me have a taste of your veggies ones you have enough ne?? (^w^)fufufufu! Yes! Yes! 🙂 I’ll give you guys some nice healthy veggies.